Tales of the Crusaders. By the Author of "Waverley", "Quentin Durward", &c. In Four Volumes. Vol. I (II-IV). Edinburgh: Printed for Archibald Constable and Co. Edinburgh; And Hurst, Robinson and Co., London, 1825. Scott chose the Welsh Marches during the reign of Henry II as the setting for his novel The Betrothed. However, unfavourable feedback from Ballantyne and Constable meant that Scott was not keen on finishing the novel. Ballantyne found The Betrothed tiresome, and Scott continued to rewrite parts of the text without reaching a satisfactory result. With all but a chapter or two printed, a despondent Scott was minded to withdraw it from publication. Ballantyne and Constable, however, were understandably reluctant to write off their collective labour and hit upon the idea of publishing it together with The Talisman, on which Scott was now working and which they judged to be far superior. The Talisman's merits, they argued, would disguise the shortcomings of its companion piece. 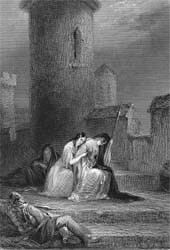 Accordingly, the two novels appeared together as Tales of the Crusaders on June 22, 1825. The plot unfolds against the backdrop of border conflicts between the Anglo-Norman and Welsh barons. Having refused the hand of his daughter, Eveline, to the Welsh prince Gwenwyn, the Anglo-Norman Raymond Berenger is killed when the incensed Gwenwyn lays siege to his castle of Garde Douloureuse. 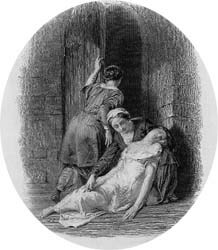 His daughter is saved only by the intervention of Hugo de Lacy, Constable of Chester who, in turn, slays Gwenwyn. Out of gratitude rather than love, Eveline pledges herself to her elderly rescuer. Hugo, though, must fulfil a vow to join the Third Crusade and sets out immediately leaving Eveline under the guardianship of his nephew and heir Damian. Though both struggle against their feelings, an unconfessed love develops between the two youngsters during Hugo's three-year absence. When Damian is wounded defending Eveline from abduction, she takes him into her castle and nurses him. Although the couple remain chaste, malicious rumours are circulated concerning the nature of their relationship, and the King is moved to act against them. A royal force takes Garde Douloureuse, Damian is arrested, and Eveline's estates are declared forfeited. When Hugo returns from the Crusades he finds that the couple have been charged with high treason and with profiting from his absence to indulge their illicit love. Hugo is able to prove that the charges against Eveline and Damian are groundless, releases Eveline from her vow, and grants her permission to marry Damian.